Yesterday was National Pizza Day - we are pretty sure that is not a religiously festival or an official government bank holiday. It was probably just dreamt up by marketing people to sell more pizza. But whatever, if it is an excuse to eat more pizza, why not? 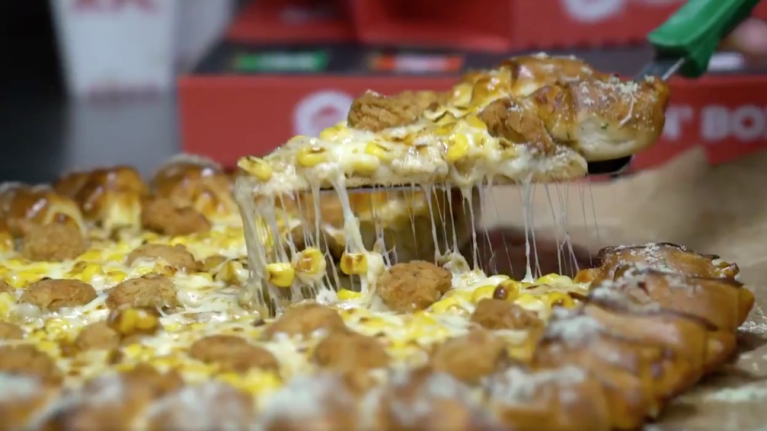 KFC and Pizza Hut have teamed up to 'celebrate' the 'holiday' with the Gravy Supreme. And it looks like quite something. It consists of a Cheesy Bites Pizza Hut pizza, with a KFC gravy base topped with a popcorn chicken, cheese and sweetcorn. Before you get too excited though, the Gravy Supreme isn't actually available for order. 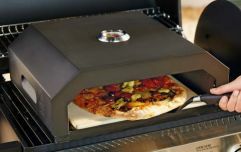 It is just a concept idea that the brands' chefs are experimenting with. They've asked if people would want to buy it, presumably with the view to maybe put it on the menu at some point in the future. Alternatively, you could just get a pizza from Pizza Hut, then stop off at KFC on the way home to buy some popcorn chicken and gravy and put it on there yourself. Both KFC and Pizza Hut are both owned by Fortune 500 corporation Yum! Brands, so the collab isn't that out of the blue. Combination Pizza Hut/ KFC/Taco Bell locations are not uncommon in the USA. QUIZ: How well do you know these movie scenes with pizzas in them? WATCH: Do you think you could take down this giant pizza-burrito?